Ridge Racer Revolution[a] is an arcade racing game developed and published by Namco for the PlayStation in 1995. It is the PlayStation sequel of Ridge Racer (the arcade sequel is Ridge Racer 2). Like the original Ridge Racer, the player races computer-controlled cars with the objective of winning a series of races, and supports Namco's NeGcon controller. Ridge Racer Revolution adds two hidden cars, and two-player support via the PlayStation Link cable, and took roughly the same time to develop as the first. The intention was to increase the depth and add features. The game borrows most of its soundtrack from Ridge Racer 2. Ridge Racer Revolution was re-released in Japan for the PlayStation The Best range in June 1997, and for the Platinum Range in PAL regions the following year. The game received generally positive reviews, although some criticised its similarity to the original. Ridge Racer Revolution was followed by a sequel, Rage Racer, in 1996. The gameplay system remains unchanged from Ridge Racer, the checkpoint and time limit system remain the same; running out of time ends the race and passing through checkpoints grants additional time, although the car drifting is more like Ridge Racer 2. The player drives using automatic transmission or manual transmission. Ridge Racer Revolution supports Namco's NeGcon controller, and adds a rear-view mirror when using the in-car view. The game consists of three courses: 'Novice', 'Intermediate' (also called 'Advanced'), and 'Expert', each having different sections opened, and incorporates modes from the original game; Race, against eleven opponents, and Time Trial, against one. Ridge Racer Revolution adds a mode: Free Run, in which there are no other cars and the player practises driving. There is no lap limit. How fast the cars run depends on which speed grade is used, selectable in Free Run, and can be unlocked for Race. It is not available in Time Trial. A new feature is the option to select the time of day in which the race takes place, although this is not available at the start of the game. Ridge Racer Revolution features a two-player link-up mode which allows the players access to the original Ridge Racer's courses known as 'Special 1' and 'Special 2'. There are two modes in two-player link-up: Race, identical to its single-player counterpart, and Versus, where only the players race against each other. Versus features a handicap option, increasing the speed of the trailing car. Like the first Ridge Racer, the player normally starts with four cars. The remaining eight are selectable on winning the mini game before the title screen (the mini game is Galaga '88 instead of the original game's Galaxian). They are mostly unchanged; their names (certain cars are named after other Namco titles) and specifications are similar to the first game. After the player wins the first three circuits, reversed versions are unlocked, and Time Trial features an additional opponent driving a secret car. There are three secret cars; the '13th Racing' (from the first Ridge Racer) of the Novice course, and the new '13th Racing Kid' (of the Intermediate course) and 'White Angel' (of the Expert course). These cars are unlocked upon winning the respective course's Time Trial race. Ridge Racer Revolution features two hidden modes; 'Drift Contest', where points are earned according to how well spins are performed on certain corners, and 'Pretty Racer' (also known as 'Buggy mode'), in which the cars size appears with deformed body sizes, similar to Choro-Q cars, which led to the arcade game Pocket Racer. Mirrored tracks that function identically to the original game are accessible. Like the first game, a music CD can be inserted and listened to instead of the soundtrack. Unlike the first game, only the last course played is loaded into the PlayStation's memory; to switch, the game disc needs to be reinserted before loading. Ridge Racer Revolution was developed over eight months by a team of more than twenty people, most of whom joined just for Ridge Racer Revolution. The biggest difficulties were the link-up mode, rear-view mirror, and running the game at high speeds. Each member had worked on other console games, and they commented that the graphics detail showed the improvements in skill and technique. The team wanted players to enjoy a more in-depth game than the original, so rather than develop a port of Ridge Racer 2, as many features as possible were added. The early designs for the new courses were made in a 'free run' programme, and used to see how fast the cars went. The rear-view mirror was added primarily with the two player link-up mode in mind. The music was mostly taken from Ridge Racer 2, and as a result, the sound was finished more quickly than the game. Soundtrack composition for Ridge Racer 2 involved Shinji Hosoe, Nobuyoshi Sano, Ayako Saso, and Takayuki Aihara, although new tracks were composed by Hiroshi Okubo and Nobuhide Isayama. The team kept exploring the PlayStation's capabilities to solve the high speed problem, although were confident it was possible. The designer, Hiroyuki Onada, commented that designing an original course was a challenge, and director Kazumi Mizuno believed that graphics quality would be degraded with a split-screen multiplayer mode, so the team decided to focus on the PlayStation's link-up instead. The game was a bestseller in the UK. The additional features and improvements over the original in particular were given high praise. Coming Soon Magazine praised its multiplayer mode, saying it "will furnish many hours of competitive fun! ", and in their conclusion remarked that the game "is an excellent racing game that will yield much excitement and challenges". A reviewer from Absolute PlayStation concurred with this by praising its playability, its "greatly" improved artificial Intelligence, and the two-player link-up feature. Both of Electronic Gaming Monthly's sports reviewers thought that Ridge Racer Revolution is better than the original, due to the cleaner graphics and improved handling on the cars, which it was believed makes them easier to control. David Hodgson of Maximum acknowledged the similarity to the original Ridge Racer but gave it a strong recommendation, arguing that removal of the slowdown and track updating of the original, the unlockables, and the two-player mode make it worth buying. His conclusion was that the game is "an instantly playable arcade racer that oozes options and playability". The Electric Playground's reviewer complimented the additions and improvements, including the "much improved" graphics and the scene changes, about which it was commented that it was a "serious improvement". It was commented that the colours are "sharp and pretty", and the link-up multiplayer mode was lauded, although the remixed music tracks were criticised because they "pale greatly in comparison to the original tracks". The new tracks were complimented as "always challenging and fun to race" by Gamezilla's Mark Skorupa, who also praised Free Run, saying it's a "great way to learn the tracks". Major Mike of GamePro believed the game surpassed the first and upheld the Ridge Racer tradition, and Computer and Video Games Magazine's reviewer commented that the game is "Everything Ridge Racer maniacs could have wanted from a sequel". Hugh Sterbakov of GameSpot was more critical. He called it "a clone of the original", and criticised the lack of split-screen multiplayer. Another critical reviewer was from Edge; he described the game as "virtually indistinguishable" from the first Ridge Racer, and commented that Ridge Racer Revolution does not fulfil the expectations evoked by the original. It was also stated that it is simply a "jazzed-up" Ridge Racer 2, and the visuals were criticised as "antiquated". Despite these criticisms, the handling was praised, and the gameplay was described as "varied". A reviewer for Next Generation contended that the original Ridge Racer was rushed in order to make it out for the PlayStation launch, and that whereas rival Sega had done an exceptional job of fixing their own launch day rush job with Virtua Fighter Remix, "Namco has simply released a disc with a new track, using the same flawed game engine". He particularly felt that the price was much too high for what was essentially an expansion pack, and concluded that anyone who bought the game would be "a half-step away from being conned". Will Groves of the Official UK PlayStation Magazine described the game as "a poor sequel", but liked the range of options provided. He described the game itself as "great", but further criticised it for not being fun, as he thought the feel is aggressive. ^ "PlayStation/リッジレーサー レボリューション". Bandai Namco Entertainment (in Japanese). Retrieved 13 October 2015. ^ 100 Per Cent Guide, p. 4. ^ a b "Maximum Invades Namco R&D Headquarters! Ridge Racer Revolution Development Team Quizzed!". Maximum: The Video Game Magazine. No. 3. Emap International Limited. January 1996. pp. 120, 121. ISSN 1360-3167. ^ a b Winning Strategy Guide, p. 6. ^ Special Extended Play, p. 71. ^ "PlayStation/リッジレーサー　レボリューション". Bandai Namco Entertainment (in Japanese). Retrieved 14 October 2015. ^ Ridge Racer Revolution manual (PAL ed.). Namco. 1995. pp. 7, 9. ^ a b Special Extended Play, p. 65. ^ Perfect Guide, p. 73. ^ a b Special Extended Play, p. 70. ^ Perfect Guide, pp. 8-24. ^ a b c "RIDGE RACER REVOLUTION". Absolute PlayStation. June 1996. Archived from the original on 5 September 2015. Retrieved 14 October 2015. ^ Winning Strategy Guide, pp. 90,91. ^ Certain Victory Guide, pp. 8,85. ^ 100 Per Cent Guide, pp. 68,69. ^ Winning Strategy Guide, p. 94. ^ The PlayStation Book. Bournemouth: Imagine Publishing Ltd. 2015. p. 171. ISBN 978-1-78546-106-4. ^ Perfect Guide, p. 76. ^ Certain Victory Guide, p. 82. ^ "Ridge Racer, 15 años a toda velocidad" [Ridge Racer, 15 years at full speed]. Meristation (in Spanish). 3 March 2012. Retrieved 13 August 2018. ^ Dale North (14 November 2008). "Destructoid interview: KORG DS-10 producer Nobuyoshi Sano". Destructoid. Retrieved 13 August 2018. ^ "Staff". 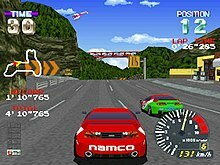 ナムコゲームサウンドエクスプレスVOL.14リッジレーサー２ [Namco Game Sound Express Vol.14 Ridge Racer 2] (in Japanese and English). 1994. p. 13. ^ Namco (1995). Ridge Racer Revolution. Sony PlayStation. Scene: Credits. ^ a b Sterbakov, Hugh (1 December 1996). "Ridge Racer Revolution Review". GameSpot. Retrieved 13 October 2015. ^ a b "Ridge Racer Revolution Reviews and Articles for PlayStation". GameRankings. Retrieved 13 October 2015. ^ a b "Box Score: Ridge Racer Revolution". Electronic Gaming Monthly. No. 81. Sendai Publishing. April 1996. p. 116. ISSN 1058-918X. ^ a b "CVG Review Ridge Racer Revolution". Computer and Video Games. No. 171. February 1996. p. 65. ISSN 0261-3697. Retrieved 4 May 2016. ^ a b "Ridge Racer Revolution". Testscreen. Edge. No. 29. Bath: Future plc. February 1996. pp. 66–68. ISSN 1350-1593. ^ a b "Ridge Racer Revolution – Sony Playstation Review". Coming Soon Magazine. 1996. Retrieved 13 October 2015. ^ a b Hodgson, David (May 1996). "Maximum Reviews: Ridge Racer Revolution". Maximum: The Video Game Magazine. No. 6. Emap International Limited. p. 120. ISSN 1360-3167. ^ a b "Ridge Racer Revolution". Next Generation. No. 15. Imagine Media. March 1996. p. 81. ISSN 1078-9693. ^ a b Shaw, John (18 October 1996). "Ridge Racer Revolution developed by Namco published by Namco for PlayStation". The Electric Playground. Archived from the original on 4 August 1997. Retrieved 24 April 2016. ^ a b Skorupa, Mark (1996). "Ridge Racer Revolution (PSX)". Gamezilla. Archived from the original on 2 February 2002. Retrieved 28 April 2016. ^ a b Will Groves (1999). "Ridge Racer Revolution". Official UK PlayStation Platinum Special. Future plc. pp. 94, 95. 9771466279002. Retrieved 22 August 2017. ^ "Official UK PlayStation Magazine". No. 8. Future Publishing. July 1996. p. 15. ISSN 1752-2102. ^ "Ridge Racer Revolution". GamePro. No. 96. IDG. September 1996. pp. 62, 63. ISSN 1042-8658. Retrieved 3 May 2016. リッジレーサーレボリューション （プレイステーション必勝法スペシャル） Rijji Rēsā Reboryūshon (Pureisutēshon Hisshouhou Supesharu) [Ridge Racer Revolution (PlayStation Winning Strategy Special)] (in Japanese). Keibunsha. 1996. ISBN 978-4766-924-275. １００パーセント遊ぶリッジレーサーレボリューション 伝授！最速ラップへのノウハウ （プレイステーション１００％シリーズ） 100 pāsento asobu Rijji Rēsā Reboryūshon denju! saisoku rappu e no nouhau (Pureisutēshon 100% shirīzu [100 Per Cent Play Ridge Racer Revolution Instruction! Fastest lap know-how (PlayStation 100% series))] (in Japanese). 6 March 1996. ISBN 978-4874-652-909. リッジレーサーレボリューション必勝攻略法 Rijji Rēsā Reboryūshon Hisshou Kouryaku Hou [Ridge Racer Revolution Certain Victory Strategy Guide] (in Japanese). Futabasha. 30 January 1996. ISBN 978-4575-285-420. リッジレーサーレボリューションパーフェクトガイド Rijji Rēsā Reboryūshon Pāfekuto Gaido [Ridge Racer Revolution Perfect Guide] (in Japanese). Tokyo: アスペクト. 27 January 1996. ISBN 978-4893-664-532. "Special Extended Play The sequel to the stunning original! Ridge Racer Revolution". Maximum: The Video Game Magazine. No. 5. Emap International Limited. April 1996. ISSN 1360-3167. This page was last edited on 28 March 2019, at 00:06 (UTC).